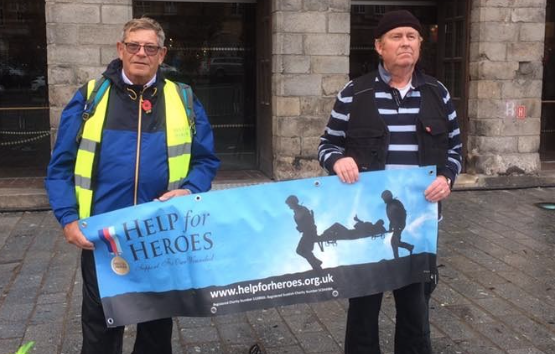 TWO Help for Heroes volunteers, with a combined aged of 135, have raised £3,000 for the military charity after walking from London to Ypres. Barry Pyle, aged 72, from Harlow, devised the fundraising challenge which saw them walk 155 miles in just 2 weeks. They started their epic journey from the Freemasons Hall in London and ended up in Ypres at the Menin Gate for Remembrance Sunday to the sound of the Last Post. “I like to think that we followed in the footsteps of our soldiers who travelled to the front lines. We also visited some of the cemeteries where those soldiers who gave the greatest sacrifice lie. Including laying a wreath of the grave of Captain Noel Godfrey Chavasse; the namesake of one of four Help for Heroes Recovery Centres”. “It’s the first time I’ve experienced a little of what military personnel go through and the camaraderie they have between each other. When you have a hard day of walking and your feet are sore you have another person by your side willing you on. Sometimes we didn’t even talk; we just knew how the other was feeling”. Barry walked alongside fellow volunteer and ex-Serviceman Bob Grove, 63, from Hatfield Heath in Hertfordshire. Despite their successful walk it wasn’t without challenges. Bob’s mother-in-law passed away on day 12; the pair walked an extra 2 miles to find a church in order to light a candle and would like to dedicate the whole walk in memory of Betty. There were also plenty of blisters, old ankle injuries flaring up and several upset stomachs but the duo were determined to finish the walk. Even with a broken toe on day 2! One Response to "Two Harlow Help for Hero volunteers raise thousands walking to Ypres"